Brief Synopsis – A longshoreman struggles with his conscience over whether he should stand up to corrupt union leaders or not. My Take on it – It’s actually quite interesting because I was completely sure I had seen this movie before, but in reality, I had only seen bits and pieces, so this is actually the first time I saw it. I now understand why so many people think that this is one of the best movies ever made. I can’t say that I agree 100% with that thought, but can understand those who think that way. Marlon Brando did an amazing job of making it seem as if he really was the man battling his conscience. Many people who discuss this movie always make the connection to the HUAC sessions in Congress and that this movie is a direct reaction to those hearings. The truth is that I couldn’t understand the connection but irregardless, the movie stands up on it’s own without that supposed connection. 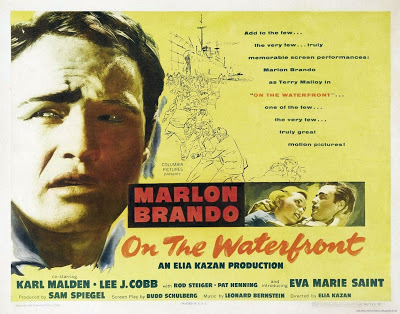 Winner of 8 (of 12) Oscars; Picture, Director, Actor (Brando), Supporting Actress (Marie Saint), Cinematography, Art Direction, Film Editing and Story. Bottom Line – Should be seen on it’s own merit and not for underlying themes. Excellent acting. Highly Recommended! I love that scene at the end with Marlon Brando all beaten and bloody still upright and walking. perseverance in difficult times is everything!